PosiTector UTG C probes feature a dual element transducer with automatic V-Path compensation. Thickness is determined by measuring t1 (uncoated) or t2 (coated), dividing it by two and then multiplying by the velocity of sound for that material (steel). See Figure 1. For uncoated materials t1 related directly to material thickness. When a material is coated the propagation time is increased and is shown above as t2. Coatings such as paint have a slower velocity of sound than that of metal. 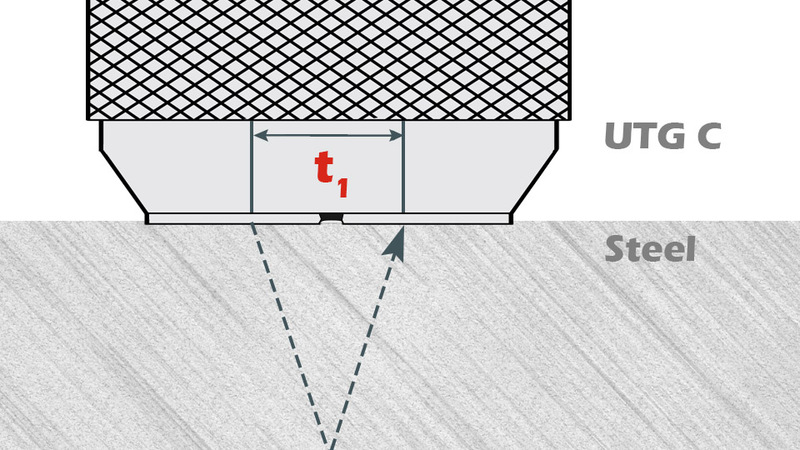 Thus the single echo technique will produce a thickness result greater than the actual combined coating+metal thickness. The result will include a significantly higher, unknown value of paint thickness. Therefore it is not a simple matter of measuring the thickness of the paint and subtracting it from the single echo measurement result. The PosiTector UTG M probe determines thickness by measuring the time between at least three consecutive back wall echoes. In Figure 2 above, multiple echo mode measures only the time between echoes. Regardless of whether the steel is coated or not, all times between echoes are the same. 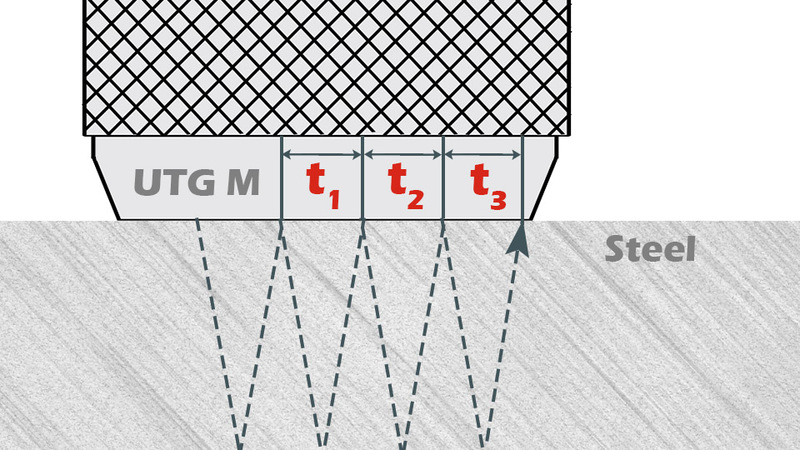 In multiple-echo mode the gage determines thickness by measuring t1 + t2 + t3, dividing it by six and then multiplying by the velocity of sound for that material. The resultant thickness calculation made by the instrument is therefore an accurate measurement of the steel thickness only, disregarding the coating thickness.